In HDTune, the 2TB Seagate Backup Plus Slim external USB 3.0 drive achieves a READ Burst Rate of 175.6MB/s, an Average Read transfer rate of 90.2Mb/s and a Max Read Transfer rate of 113MB/s. Access time is 17.8ms. 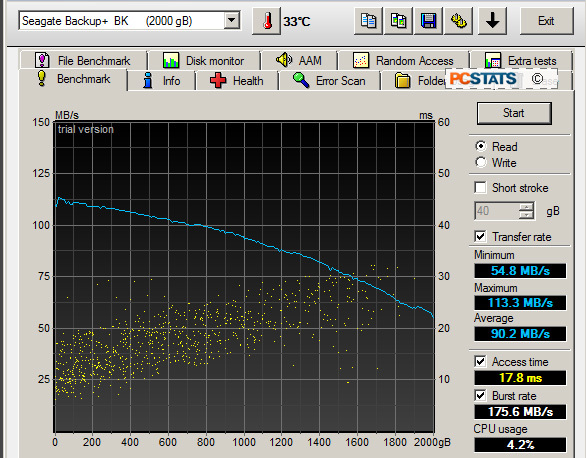 Average read transfer rates are a little sluggish... next let's see what the write test results look like. Here we see the 2TB Seagate Backup Plus Slim external USB 3.0 drive performs at about the same pace: Burst Write speed is 130MB/s, Average Write speed is 89MB/s and access time is 171.3 ms. Clearly not record shattering compared to internal drives, but not out-of-the-ballpark-slow either. 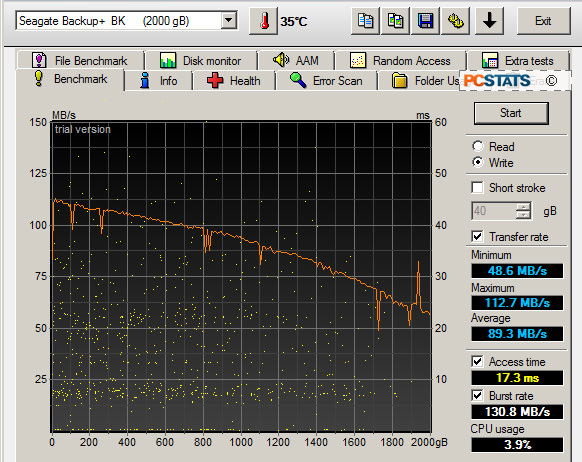 Next up, Sandra 2012 HDD results.